The SM27 is a rugged and versatile large-diaphragm, side-address cardioid condenser microphone. It has low self-noise and extended frequency response that picks up vocal and instrument nuances with clarity. 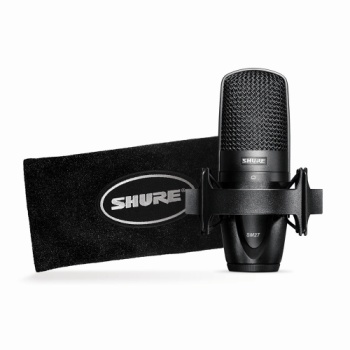 Durable Shure construction features three separate mesh layers that reduce wind and breath noise. Equally comfortable on stage or in the studio. Uniform cardioid pattern for superior off axis rejection. Superior transient response from a low-mass large Mylar® diaphragm. Flat, neutral frequency response for natural reproduction on stage or in the studio. 3-position switchable low-frequency filter helps reduce unwanted background noise or counteract proximity effect for consistent, extended low-end. Durable metal construction. Three separate mesh layers reduces wind and breath noise. 15dB pad for performance consistency across a wider range of high SPL sources.